A good start: Weeklong FOCUS Orientation includes sessions for parents as well as for students. It happens every year at this time. Restaurants get more crowded and stores that have stocked their shelves in preparation see those shelves start to empty. 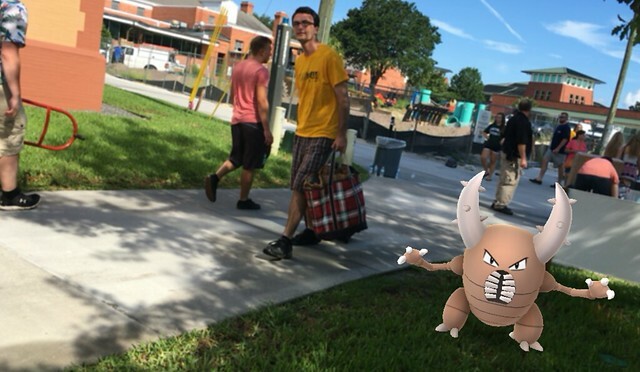 It can only mean one thing: It’s move-in day and students are arriving at Stetson for the start of the fall semester. Over the next few days Stetson expects the arrival of 2,052 students who will be living on campus. Total students for this campus is nearly 3,500 including approximately 950 new students (exact numbers for the incoming class are not available until census day in September). For the College of Law in Gulfport, 139 law students are living on campus this fall. The College of Law welcomed 276 new J.D. students for the first day of class on Aug. 12. As a graduate school, most of the law school’s students live off campus. College of Law Dean Christopher Pietruszkiewicz greets students. This year, there is plenty of on-campus housing in DeLand thanks to the efforts of Housing and Residential Life and facilities management, which over the summer renovated two apartment complexes (Colonial Oaks and Stetson House Apartments) as well as five catalyst houses. Stetson also is leasing space for students in Plymouth Apartments. 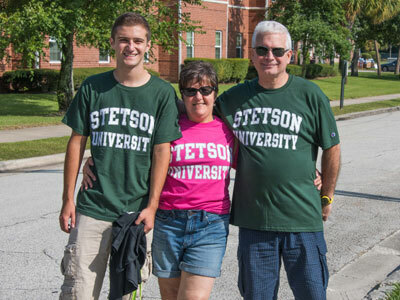 Family and friends help first-year students make the transition to college life at Stetson’s main campus on Move-In Day. “We completely refurbish our apartments when we buy them,” said Al Allen, assistant vice president for Facilities Management. Renovations include new roofs, air conditioning, plumbing, flooring, bathrooms and more. Plymouth Apartments also were renovated before being leased. 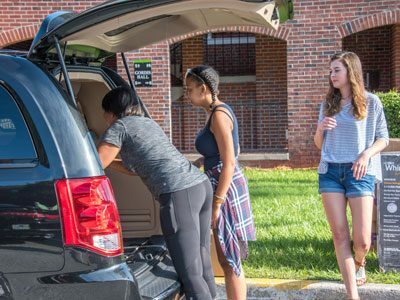 Residence halls have been spruced up: Conrad Hall received a new metal roof, Emily Hall has new air conditioning, and at University Hall the air conditioning has been enhanced, bathrooms renovated and carpet replaced with hardwood floors. Carpet also has been removed from Conrad and Chaudoin halls. In the spring, Stetson Today ran an article on renovations and construction happening on campus this summer. It provides more details including the attention paid to eco-friendly construction materials and conservation.